Image from page 9 of Pan Am Clipper, Vol. 12, No. 4, July 1986. Caption reads: "First job of the day was to type the menus." Image from page 6 of GMRD Clipper, November 1965. 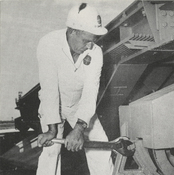 Caption reads: "George Ponader puts muscle behind wrench to tighten bolt in service structure transfer table at Pad 14." Image from page 4 of Sales Clipper, Vol. 17, No. 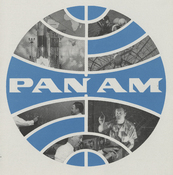 4, April 1959. Caption reads: "Clipper Star: PAD's entire Clipper fleet carries this statehood salute to all Pacific nations. Stewardess Florence Nebeling points to the decal." A perfectly coiffed Pan Am stewardess sporting "The Jet Age Look"